Grandborough Primitive Methodist chapel in the Leamington circuit was opened on July 6th and 7th 1856 to serve a neighbourhood of around 500 [people. The village had been missioned for the Connexion some twenty years earlier by Messrs. Leaker and Langham. Subsequently, services were held in brother E. Tims house, and in time the society bought a part of brother Tims’s garden to be the site of the chapel. Preachers at the opening were Rev. G. Warner, of Malmesbury, Rev. J. Webb, Baptist minister, of Thullerstone and Rev. A. Smith, Baptist minister, of Branstone. “On Monday a tea-meeting was held; and although it was a busy time, being hay harvest, we had ninety persons to tea.” The celebrations were recorded by H Platt in the Primitive Methodist Magazine of 1856. 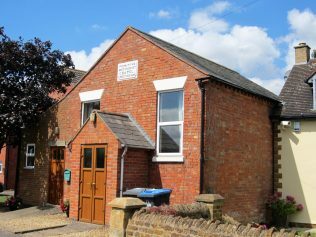 The chapel is still active in 2017 as Grandborough Methodist church. Thanks to Anne Langley for providing a photo of the chapel as it is now.